Marvel Studios has once again captured headlines lately with their announcement for their upcoming film slate. While the news that a sequel to Ant-Man will be made came as a nice surprise, there are now rumors percolating about what films will get produced. It’s intriguing food for thought starting with the revised schedule for their Phase Three Marvel Cinematic Universe (MCU) films. 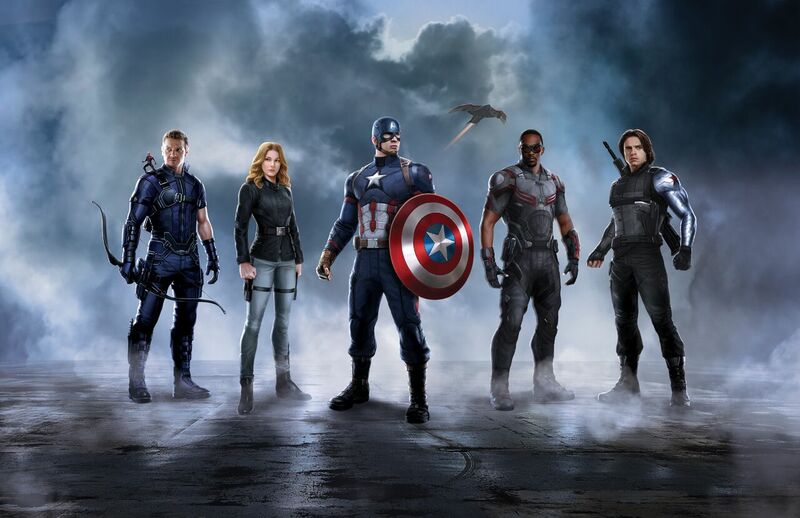 The third phase of the MCU films starts next year on May 6 with the release of the eagerly awaited Captain America: Civil War, which many are calling Avengers 2.5 because it’s stuffed with so many superhero characters. Next in November 4, the Sorcerer Supreme himself Doctor Strange makes his big-screen debut. From there Marvel Studios amps up their schedule by releasing three films per year starting in 2017 with Guardians of the Galaxy, Volume 2 on May 5, a Spider-Man reboot for July 28 and finally Thor: Ragnarok on November 3. Now the 2018 slate has been changed to accommodate the second Ant-Man film. This means that Black Panther has been moved up to February 6, instead of July 6. That slot now goes to Ant-Man and the Wasp and Avengers: Infinity War, Part I debuts on May 4. Sadly for some fans, the Captain Marvel film originally scheduled for November 12, 2018 will instead come out the following year on March 18. The final two Phase Three films for 2019 will include Avengers: Infinity War, Part II on May 3 and Inhumans on July 12. Ant-Man turned out to be a bit of a surprised for many who predicted it would be Marvel Studios’ first flop. Instead it made $178 million domestically and even more overseas. While it wasn’t a humongous blockbuster, Ant-Man earned a healthy profit and lots of good will from fans who appreciated its quirky charm. The fact that there will be a sequel proves that Marvel has a lot of confidence in the property. So what will Ant-Man and the Wasp be about? Here’s a thought, while the first film was basically a heist caper, the sequel could be a rescue story or have a man vs. nature motif. The film could be centered on rescuing the original Wasp who was lost in the quantum realm in a flashback scene in Ant-Man. 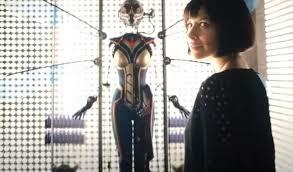 In fact, some observers of the film picked out a silhouette that resembles the Wasp when the title hero was momentarily trapped in the subatomic universe. Having Ant-Man and the Wasp exploring the quantum realm and finding new worlds will be a fun twist and visually arresting. After that if Marvel Studios decides on another Ant-Man film they can call it Giant-Man as Ant-Man morphs into Giant-Man to follow the comic books in a sense. 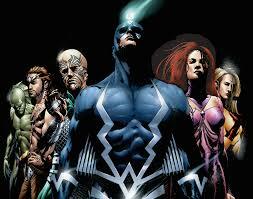 The hot rumor right now is that Marvel Studios will cancel the planned Inhumans film. That is disquieting given the attention the Inhumans property has received lately from Marvel. For a while now, Marvel Entertainment had been promoting the Inhumans in comic books and on TV in Agents of S.H.I.E.L.D. as a stand-in for the X-Men. 20th Century Fox holds the film rights to the famous X-Men and a turf war has started up between Fox and Marvel that has turned ugly. Marvel has de-emphasized the mutants in their comic books and merchandising, and is instead focusing on the similar-themed Inhumans. 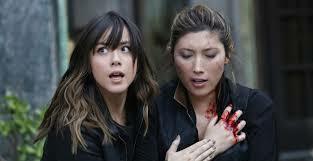 Comic books and Agents of S.H.I.E.L.D. episodes centered around the Inhumans follow the same themes explored by the X-Men: outsiders with superpowers that are feared by society. Right now, both mediums are running full steam ahead with the Inhumans to set up their foundation and increase public awareness. But a new wrinkle developed when Marvel Studios chief Kevin Feige no longer had to report to Marvel Entertainment leader Ike Perlmutter. The two had an acrimonious relationship in the past and Feige was “promoted” to answer directly to Disney head honcho Bob Iger instead. Before, Feige and Perlmutter were forced to work together on the film and TV properties. Now those two divisions are separate and while Feige is still involved with the films, he doesn’t necessarily have to coordinate with the TV shows, which Perlmutter is still in charge of. It’s unlikely that Disney will allow the MCU to split apart over this, but the potential cancellation of the Inhumans film could be a casualty of the split between the two chiefs. It would be unfortunate given that Marvel has spent a lot of time developing the property. But honestly, the Inhumans aren’t the most popular Marvel property and are seen as just a substitute for the more popular X-Men. Then again, it’s all just a rumor. One reason behind the rumor about the Inhumans may be due to a potential coming ceasefire between Fox and Marvel. Right now, Fox is negotiating with Marvel for the TV rights of an X-Men TV show and who knows what is on the bargaining table? Could Marvel be allowed to use the word “mutant” in their films and TV shows? Maybe Fox will give back the rights to certain characters, or enter into a deal like Sony and have a co-production that mixes the mutants with the MCU heroes. Or maybe Fox is crying “Uncle!” over the Fantastic Four and is ready to give up on them. In any event, what was most intriguing about Marvel Studios’ schedule changes were the three unnamed films now slated for 2020. In that year, Phase Four of the MCU begins with films scheduled for May 1, July 10, and November 6. It’s fun to speculate that they could be about the X-Men, the Fantastic Four or Iron Man 4. But to be realistic, those three films will most likely be Guardians of the Galaxy, Volume 3, a Doctor Strange sequel (depending on how the first film performs), and another Spider-Man film. Then again if the Inhumans shelving is true then the Doctor Strange sequel could take up the Inhumans’ slot and one of the Phase Four films could be about a new property. How about the Runaways? At one point the young superhero team was to be one of the Phase One films early one. 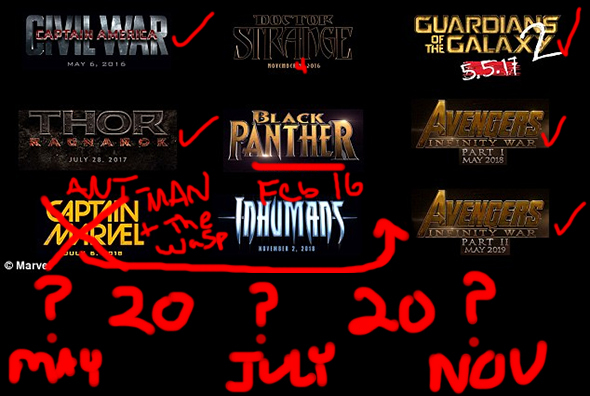 Needless to say, it’s way too early now to properly predict what Marvel Studios is planning and it’s all contingent on how the Phase Three films pan out. For now, all we can do is wonder and watch the newsfeed. The supposed spat between the film and TV divisions of Marvel is disheartening and hurts not only Marvel (at least in terms of reputation) but also the audience who love the overall Marvel screen universe. Hopefully Inhumans will stil be on the cards, after all there are two ongoing comic books due to be lauched, plus we have what’s going on in Agents of SHIELD. Why push all that simply to shelve a potential blockbuster? Good news about Ant-Man though! In the end, Disney will probably step in and tell the boys to play nice. Part of the hesitation over Inhumans is probably because of their reception. To many people, they come off as X-Men substitutes, which is a shame since some good stuff has come out of the comics lately. Another reason could be due to the budget projections, Marvel should debut them in the next Avengers film or another MCU film like Dr. 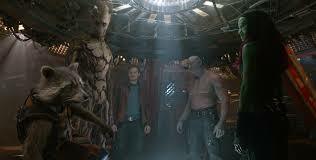 Strange or Guardians 2 and see what the reaction is before making a final decision. I hope so, it’s a little childish and we all want the Marvel screen universe to continue to succeed! Good idea about incorporating Inhumans into Guardians/Avengers – they’d fit quite comfortably into Infinity War!